The core of what we do, as a department, is to foster in our students a love of learning. Students do not learn maths solely for use in future work, as we recognise that not every student will work in a related field. Instead we emphasise the important skills gained through the learning of maths: communication, logical thinking, reasoning, rationalising, problem solving, financial awareness and team building, to name a few. Throughout Key Stage 3, students develop a mastery approach to maths. Because of the nature of maths, you cannot move on to a more advanced topic until you have grasped both the concepts and methods of the underlying skills. For that reason we have split the curriculum up into 7 ‘blocks’ , or units, of work, each roughly the same difficulty, but cover a wide range of skills needed before they can move onto the next unit. We assess students four times each year, and from this identify gaps within their current unit. Students will then only be taught what they do not know. This means each class has a bespoke scheme of work, tailored to the students. Additionally, skills which students know something about, but haven’t mastered, will be set as home-learning, meaning every student will have individual work specific to their learning need. The Archimedes unit covers basic number work and pre-algebra, underpinning the fundamentals of the number system. Students on this unit will also begin to look at 2D shapes and basic methods of presenting data. The Fibonacci unit begins to look further into ratio and proportion. It further develops students’ understanding of the number system and the relationship between numbers and operations. 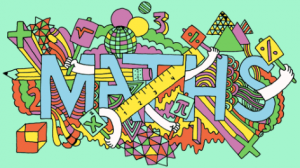 Pre-algebra develops to basic algebraic notation and methods, whilst students also learn to manipulate data with charts and averages, and begin to transform shapes mathematically. The Da Vinci unit looks at estimation and rounding, and takes an explicit look at problems involving fractions. Students begin to become more accurate with geometrical constructions and look at more advanced statistics and charts. Algebra is now used more formally throughout the unit. The Pascal unit revisits ratio and proportion through problem solving and more advanced methods. Algebraic work becomes more complex by allowing students to model problems with algebra, and solving them. There is a greater look at sequences and algebraic graphs, alongside a more accurate view of probability. The Newton unit develops students’ reasoning skills as they are asked to mathematically justify problems and solutions through gained understanding. Students learn how to manipulate algebra in order to solve more advanced problems and will look at graphs of higher orders. Students will begin to scrutinise statistics and methods using mathematical evidence. The Turing unit looks at numerical methods to solve higher order algebraic problems. Manipulating and transforming graphs forms a basis for algebra and geometry skills, whilst trigonometry is now introduced. Statistical distributions are looked at and analysed. Once students have mastered a unit they move on to the next, with the aim of mastering three units over Years 7 to 9. Each student will have their own starting point when they join us in September of Year 7, and therefore their learning journey is unique to them. In Key Stage 4 a similar system of assess, teach and review cycles are used. In Year 10 students will be assessed throughout the year on previous GCSE papers. Teachers will identify gaps in understanding for their class and will address these gaps before moving on to new content (especially content which relies on more basic skills being understood). Whilst students will be familiar with problem solving and key words throughout Key Stage 3, Key Stage 4 students will become much more familiar with the structure of GCSE exams, to help them better prepare. In Year 11, students will follow 4-weekly cycles. Each cycle will start with an assessment (either Higher, Crossover or Foundation). From these assessments bespoke plans will be put in place for each class for the remaining lessons in the cycle. Therefore students will only ever be learning content that has been recently assessed, and they have got wrong. At the start of the new cycle, the assessments adapt to remove content that was understood previously, re-assesses content that was recently taught, and introduce new content in order to check for understanding. For each assessment in Year 11, staff will make a “how to” video for every question. These will be available during the assessment review lesson, but also at home for revision. Revision sessions are available before and after school for Year 11 in preparation for their GCSE exams. We also recommend the use of Mathswatch (www.mathswatchvle.com), Corbett Maths (www.corbettmaths.com) and Mymaths (www.mymaths.co.uk) as revision aids. There are often maths-based activities to get involved in during enrichment, including maths puzzles, the cipher challenge and primary maths workshops. Our Maths Hub creates a comfortable environment for pupils to do numeracy work, get help on their homework or to learn more about the world of maths!